We offer a 100% Satisfaction Guarantee on all our products - and we don't care where you bought it! Don't like it, we'll take it back. 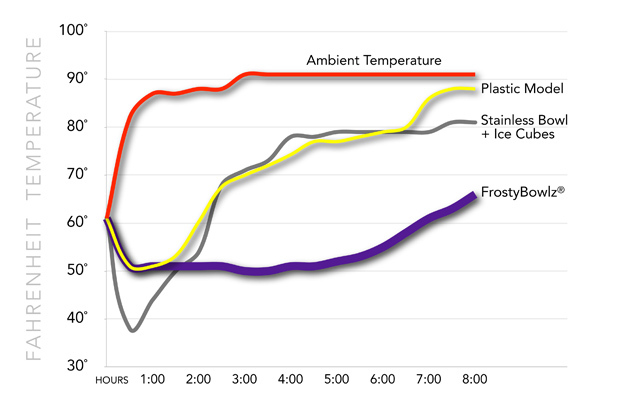 What's behind the FrostyBowlz® Design? FrostyBowlz® Chilled Pet Bowl may appear to be a simple product, but it’s actually the result of several years of experimentation and engineering. 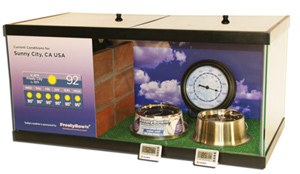 We started with one basic question in mind – how can pet owners keep water or canned food cool in a bowl for an entire summer day? Just like people, pet owners feel their pets deserve a cool refreshing drink on a hot day. Their only option has been to drop a few ice cubes in the bowl and hope for the best. In fact, that’s exactly what 43% of us do! But ice cubes only last for an hour or so, and can’t be used with canned food. A few plastic bowls with freezable inserts have been developed over the years, but none of them have kept their cool for one full day. But now FrostyBowlz® is here. 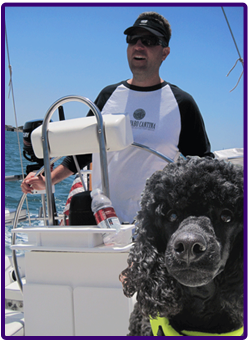 FrostyBowlz® was inspired by our dog, Jäger, a black miniature poodle. During our first summer with Jäger, we noticed he didn’t drink much water while we were away even though he had nice indoor and outdoor areas to play and relieve himself. When we came home each day, we poured him some cool water from the refrigerator. He just lapped it up, as if he was dying of thirst. It made sense to me, I like cool water, why wouldn’t he? It was remarkable. Jäger wouldn’t touch his warm water in the garage, but he sure liked the cool stuff. This realization sparked an idea as my wife and I sat on the patio during one of those warm summer evenings. We scoured the Internet for a bowl that would keep his water cool and found nothing of any real quality. So we decided to create something ourselves. We came up with a design that made sense to us and worked with local and international factories to perfect our idea. Finally, after more than two years of hard work, FrostyBowlz® was born. Our little Jäger loves to drink from his FrostyBowlz® on warm summer days, and it sure lasts longer than the ice cubes we used to add to his water. Not to mention, the stainless steel bowl itself is far nicer than any bowl we’ve seen at the major retailers. We have extra bowls that we use to serve Jäger’s food, as well as his water. So now I’m sharing FrostyBowlz® with you. I really hope you and your pets enjoy it as much as we do.